The 80th theme for #FoodieMonday #Bloghop is Cookbook Cooking. Now I certainly do not have a shortage of cookery books, they line a whole shelf in the kitchen. I’ve left some in Bangalore and have a few in Montreal. So when my friends from FoodieMonday decided on cookbook cooking, I didn’t know which one to choose. I could have played it safe and selected my favourite Tarla Dalal. However,I remembered the cookbook that my son and daughter in law had given to me as a Christmas present 2 years ago. I’d drooled over the pictures and wowed all the recipes, closed it and put it on the shelf. So I thought its time to dust it and actually make something from that book. Which book you may ask? Well its a thick and heavy vibrant vegetable cooking from London’s Ottolenghi called Plenty More by Yotam Ottolenghi. Vibrant it definitely is. He uses such exotic combinations to create drool worthy, exotic, healthy concoctions. Yotam Ottolenghi is an Israeli born British Chef. He’s owns a few restaurants in UK. Most of his dishes whether vegetarian or non vegetarian are colourful, vibrant and may have the most unusual combinations.My cousins have dined at his restaurant and vouch that’s its one of the finest dining experience.The first time I had an Ottolenghi dish was when my cousin prepared a sweet potato and pomegranate salad from his book.And I fell in love with the combination and scrumptious salad. Pomelo with peanuts and sesame seeds, black glutinous rice with chantrelle mushrooms, eggplants cooked with curry and other Indian spices but with lemongrass flavour, pancakes with gooseberry and ricotta, fava beans with roasted garlic and ricotta.The combinations are endless. Dining at his restaurant is on my ‘bucket list’. Till then will have to prepare some of those enticing dishes myself. When you go through most of his recipes, one thing you’ll notice is that Ottolenghi uses fresh ingredients, no opening cans and using ready made sauces. So that’s my kinda guy… use fresh whenever possible.Sourcing a lot of the ingredients he uses is not easy in a place like Mombasa. Obviously, I could not identify the recipe to prepare by the photos only. 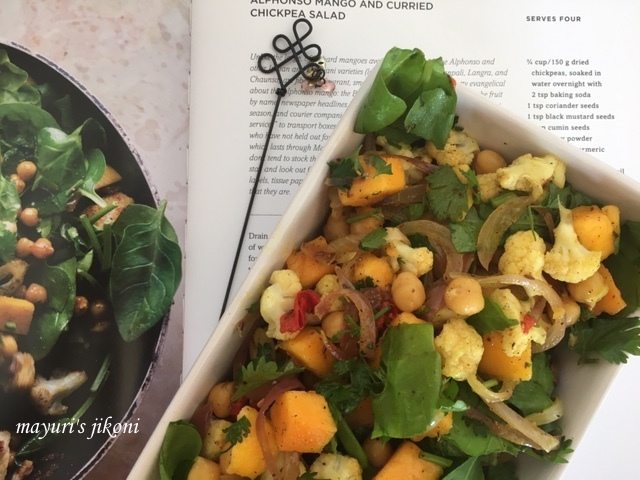 I had to go through quite a few till I came across the Alphonso Mango and Curried Chickpea Salad. Ahhaa, so here’s one I can make as I have all the ingredients….well almost. So what if I didn’t have the famous Indian Alphonso or the ‘so common in the western world’ baby spinach. Our Kenyan apple mangoes are without any fibers, sweet and very aromatic. I chopped up a bunch of the normal spinach and voila I had a delicious salad for dinner. We Indians know that there is no spice called curry powder. So added my own masala powder. Here’s the recipe for this delicious, filling and satisfying salad. I halved the original recipe. Soak the chickpeas overnight in warm water. Next day drain out the water, wash them and put them in a pressure cooker or a pan with enough water and ½ tsp salt. If you are using a pressure cooker, close the cooker with the lid and put it over medium flame. Cook the chickpeas for 3 whistles. If you are using a saucepan, add enough water and put the pan over medium flame and cook till the chickpeas are done. Drain out the water and keep the chickpeas on the side till required. Heat water in a pan. When it is boiling, add the cauliflower florets and blanch for 1 minute. Pour the cauliflower with the water into a sieve or colander. Spread out the cauliflower on kitchen towel to dry them. Roast coriander, mustard and cumin seeds in a wide pan till the mustard seeds begin to pop and you get an aroma of the spices. Crush the spices in a herb mill or in a mortar with a pestle. Add sugar, turmeric powder, curry powder to the spice mixture and mix it well. Heat 1 tbsp oil in the wide pan. Stir fry the onions till they are slightly soft. Add the chickpeas, spice mixture and ¼ tsp salt. Mix it well. Take the mixture out into a bowl and let it cool a bit. Heat the remaining oil in the same pan and add the cauliflower florets.Stir fry the cauliflower for 2-3 minutes. Add ¼ tsp salt and mix well. Add this mixture to the chickpea mixture. Wash and pat dry the spinach. If you’re using normal spinach leaves then cut then into bite size pieces. Add mango pieces, spinach, chopped chilli and chopped fresh coriander to the chickpea cauliflower mixture. Drizzle the lemon or lime juice over it. Mix well and serve. The original recipe suggested to cut the cauliflower into 1½” florets but I cut them smaller. Keep an eye when blanching the cauliflower, you don’t want to over cook it. Don’t use an over ripe mango. The mango should be ripe but firm. Adjust the amount of spices and chilli according to your taste. Beautiful share Di! This book has been on my must buy list of cookbooks. Such a vibrant colors in salad..I love salad and it looks very yummy !! Love the play of colours in the salad…loved the combos you have mentioned in the post that are in the cookbook. Thanks Pushpita, it is a wonderful book and he has several others too. I love salads that are colourful Saswati. All his recipes have unique combinations.